Design workshops help companies frame challenging problems and find optimal solutions - but what happens when you're on a globally distributed team? The chops we've developed for running workshops and meetings in a room together don't always map to online. It’s our goal to show you how, with forethought, conducting remote workshops can be as productive as running them in person. 2. How to create the flow that guides your participants through the discussions and gets you to the insights. 3. 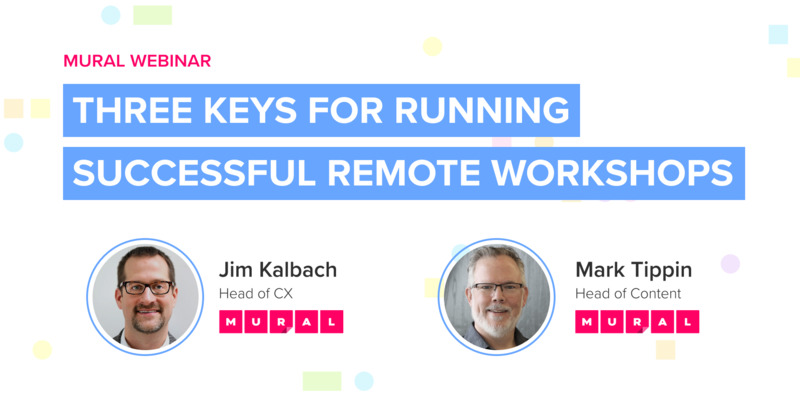 Insights from industry leaders that are using MURAL to run remote design workshops. They also live demo'd an online workshop activity with remote participants and answered attendee questions in a Q&A which we documented in the presentation mural. Live demoing remote participants in an online workshop activity. And as always, if you missed the webinar, we've got you covered. If you enjoyed the webinar and the book, we encourage you to share them with your community - and we'll repost your message to our network too 🤩.